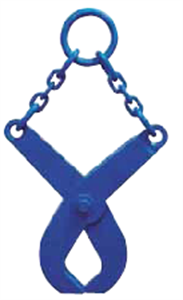 This style of fixed diameter tong is ideal for lifting round bars, cast or steel pipe. The load must be balanced during the lift. Can be used in pairs attached to a lifting/spreader beam to handle longer loads. Engineered and manufactured to ASME B30.20 & BTH-1 Design Category B Service Class 2. All tongs are proof tested to 125% capacity and certificates available upon request.